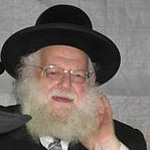 Rabbi Pesach Eliyahu Falk is a posek in Gateshead. He was a student and is a frequent lecturer at Gateshead yeshiva. He is well known for his works on Jewish Law concerning the laws of modesty.